Background and Objective: Melkersson Rosenthal syndrome (MRS) is a rare disorder of unknown etiology and comprises the triad: orofacial edema, recurrent facial paralysis and lingua plicata. In the current literature confusing heterogeneity exists, mixing together the historically grown terms cheilitis granulomatosa or granulomatous cheilitis, Melkersson Rosenthal syndrome and the umbrella term Orofacial Granulomatosis (OFG). Methods: We provide a systematic review comprising all three disease entities of orofacial granulomatosis using the computerized database “Pubmed Medline” entering the keywords “orofacial granulomatosis” (141 references), “Melkersson-Rosenthal syndrome” (207 references), “granulomatous cheilitis” or “cheilitis granulomatosa” (102 references) back to 1956. Full-text journals and case studies were included, and data synthesis was performed individually. Results: Etiology remains unclear for all three disease entities. Etiological relatedness to chronic inflammatory bowel disease is under discussion and effectiveness was found for different treatments, e.g. local triamcinolone injections, antibiotics, surgical interventions, TNF alpha blockers or exclusive enteral nutrition. No randomized controlled trial concerning the therapy of orofacial granulomatosis was found. As a consequence, the therapeutic conclusion is drawn mainly from small case series, thus limiting the evidence of therapeutic interventions. Conclusion: OFG with the sub-entities MRS and cheilitis granulomatosa is an etiological obscure disease process with various possible therapeutic interventions potentially alleviating the disease course but to broaden treatment knowledge further study in randomized controlled trials is needed. Keywords: Orofacial granulomatosis, melkersson rosenthal syndrome, cheilitis granulomatosa, intralesional steroids, therapy, review. Keywords:Orofacial granulomatosis, melkersson rosenthal syndrome, cheilitis granulomatosa, intralesional steroids, therapy, review. Abstract:Background and Objective: Melkersson Rosenthal syndrome (MRS) is a rare disorder of unknown etiology and comprises the triad: orofacial edema, recurrent facial paralysis and lingua plicata. 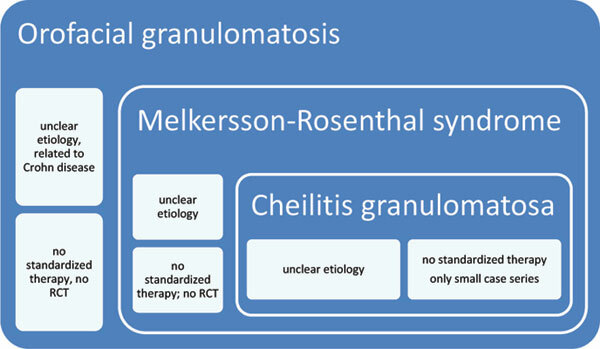 In the current literature confusing heterogeneity exists, mixing together the historically grown terms cheilitis granulomatosa or granulomatous cheilitis, Melkersson Rosenthal syndrome and the umbrella term Orofacial Granulomatosis (OFG).